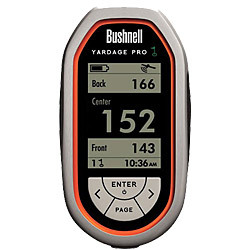 "Bushnell Yardage Pro GPS For the golfer who just wants to know the distance to the front, center and back of the green, it doesn't get any simpler. It's all there - at a single glance. We partnered with iGolf to offer the largest, most accurate golf course database in the world. Features • Simple one touch buttons for quick and easy access to information • Front, back and center yardage constantly displayed • Battery level indicator • Small and light weight to fit in a shirt pocket and one hand operation. Includes • Includes lithium-ion rechargeable battery • USB PC interface for downloads • AC Charger • Includes bag/belt clip • Comes with user guide System Requirements • PC with Microsoft Windows 2000/XP/Vista or Me* • 100MB or greater available hard drive space for Sync application and course data • Internet access (a high speed connection is preferred) • USB port If you have any questions about this product or would like to order by phone, please call us Toll Free at 888-733-8383. We look forward to hearing from you!"